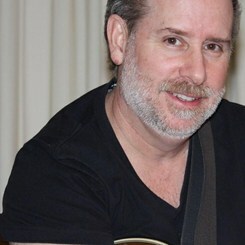 A career musician, Westlyn earned a Bachelor of Music Education at Shenandoah Conservatory of Music Class of 1979 (before it became Shenandoah University) and started out doing solo guitar, piano and vocal gigs in small clubs at night and teaching private students by day. Over time, he played in a wide variety of groups, from straight-ahead commercial work to more experimental jazz-influenced ensembles. His teaching schedule also grew to include adjunct faculty positions at John Tyler and J. Sergeant Reynolds community colleges in Richmond and Chester, Virginia. In the late ‘90’s, Westlyn took the opportunity to buy the assets of a struggling recording studio and founded Full Moon Enterprises. The first release from the studio was his own debut album, “Go Figure”, 10 original songs recorded with a full band. The business expanded to include web services, promotions, CD graphics and design. By 2004, Full Moon had outgrown their present location and the business moved to a space twice the size that would allow for the addition of video/DVD production, CD and DVD duplication and a private school. In a custom constructed space, ReaLife Multimedia, LLC was born. As a division of the company, the ReaLife Academy of Music & Arts offered its first course selections in the fall of 2004. The spring semester, beginning in January 0f 2005, includes a catalog of six music and technology related courses. ReaLife Multimedia, LLC closed in July of 2007. Westlyn also served four terms as president of the Virginia Organization of Composers and Lyricists (VOCAL). Currently, Westlyn has a private practice in teaching guitar and piano in the greater Richmond, VA area, meeting between 35 and 45 students a week. In May of 2010, he founded Westlyn Worldwide, LLC as a corporate home for his composition and arranging work. In 2013, he was commissioned to write the soundtrack to Breathing Life into the Chesapeake: Of Oysters, Boats and Men, a documentary about the watermen of the Chesapeake Bay. The work won the Platinum prize for documentaries at WorldFest Houston in April of 2014. The work was expanded into a seven movement composition for classical guitar and string quartet entitled Chesapeake, based on the themes used in the film. On January 10th 2016, Chesapeake will have its premiere performance as part of the 2nd Sunday South of the James Concert Series sponsored by Bon Air Presbyterian Church. Westlyn Worldwide owns b-oo-k.org: The “Best of our Knowledge” Project, musicianation.com & .org, and musicianship.org, among others. Westlyn also plays both solo and in a duo setting, mixing his originals with popular and jazz fingerstyle guitar and piano arrangements. In addition, Westlyn is working on a collection of solo guitar works with the working title “A Show of Hands”. Request Lessons with James J today!